The official figures released Thursday say that 2,774 people slept rough in England in 2014, up from 2,414 in 2013 and 1,768 in 2010, the year the coalition government was formed. Homelessness charities are urgently calling on party leaders to review the situation. London now has 742 people sleeping rough every night, an increase on 2013 figures of 37 percent, compared with a rise of 7 percent nationwide. The charity Centre Point confirms the number of rough sleepers in London has increased by nearly 40 percent in the last year. London Mayor Boris Johnson, who six years ago pledged to end rough sleeping in the capital by 2012, has also been asked to account for the figures. 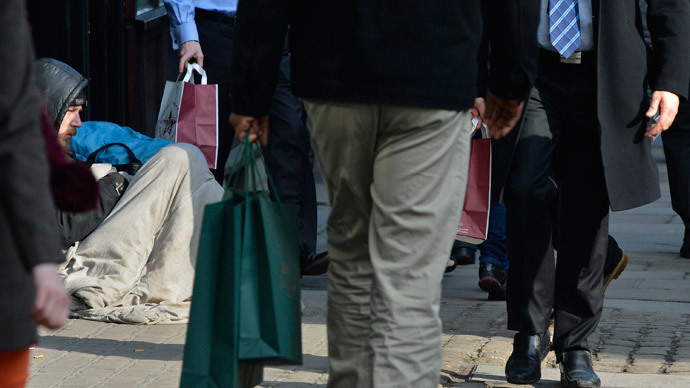 Councils are “turning people away” to sleep on the streets, according to the charity. “These figures show that the law is badly failing people facing homelessness,” said Crisis chief executive Jon Sparkes. The UK government needs to do something to help the homeless, I've noticed a massive increase in the number of homeless people lately. Housing costs and low pay have made it “more and more difficult” for people to keep a roof over their head, the MP says.